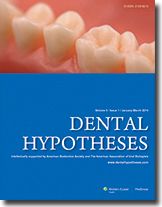 Dental Hypotheses Official Publication of CRET, Inc.
Official publication of CRET Inc.
Dr Rossomando recently published in the ejournal Dental Hypothesis an article about CRET and its collaboration with US dental schools. In the first decade of the 21 st century, computer-based equipment and implant restorative technologies rapidly entered dental practice but unfortunately not dental schools. To remedy this discrepancy, dental companies formed an organization to provide new equipment and products to the schools and to assist in the education of faculty and students in their use. The Center for Research and Education in Technology (CRET), the organization formed, forms a collaborative partnership with a dental school to equip a technology center (TC), a unique facility within each participating dental school, for senior dental students to treat patients using the most modern equipment and products on the market. To date, CRET has opened two TCs, one at Loma Linda Dental School and the other at the University of Missouri Kansas City Dental School. CRET represents a unique partnership between dental companies and dental schools that it is hoped will become a model for future collaborations. Since the beginning of the 21 st century, the practice of dentistry in the United States, and probably elsewhere, has changed. The introduction of computer-guided equipment including digital X-rays and CAD/CAM, together with new restorative materials, such as composites, and new methods for restoring lost teeth, implants, has changed dental practice more in the last 13 years than in any other time in the history of our profession. Unfortunately, dental schools have not been able to incorporate these advances into their educational programs. While, there are no doubt many reasons for the slow acceptance in dental schools, two stand out: Financial, the new equipment is expensive; and time, curriculum changes and training faculty require months if not years to complete. Shortly after these new technologies entered the dental market, dental distributors and manufacturers recognized both the necessity of incorporating these advancements into the dental curriculum and the potential for barriers to their acceptance. Many companies inaugurated equipment donation programs and provided continuing education for dental faculty. These programs, however, were not successful. When company representatives visited the schools, they found the equipment stored in closets, unused, and faculty unaware of the equipment or the educational programs. Clearly a different approach was needed. The center piece of the CRET Technology Education Program was the establishment of a CRET TC at each participating school. The TC is a facility within a dental school that is designed jointly by CRET and the schools to look and function like a private dental office. The TC is also designed to function as a "hands-on laboratory" where dental students can learn practice management. CRET members consign equipment and products to the TC and CRET members are responsible for service and to ensure that equipment and products are utilized correctly. Finally, each CRET manufacturer is responsible for training faculty and students on proper use of the equipment and products. CRET TCs have been opened at Loma Linda University Dental School and at the University of Missouri Kansas City Dental School. Each TC has six treatment rooms, with each room outfitted by a different manufacturer. As all senior students rotate through the TC, each student has an opportunity to experience operatory equipment (and other equipment and products) from more than one manufacturer. In addition, the TEP includes both equipment and merchandise surveys for students to provide feedback to manufacturers on utilization of products. It is expected that this experience will produce a more educated dental graduate as industry customer. There are two other educational components to the CRET TEP. One includes a curriculum to introduce equipment and products in years 1, 2, and 3 to ensure that when students enter the TC in the 4 th year they are familiar with use of all the equipment. The CRET collaboration with dental schools is an innovative program to solve a very real problem. It is expected that innovative technologies will continue to enter the dental profession as biobased equipment and products emerge from incubator companies into the main stream of dental marketing. Because of the costs and training involved, a mechanism is needed to ensure that these innovations can enter the dental curriculum quickly but with a minimum of commitment by the schools. CRET has developed a program that will allow new products to enter as they are developed and equally important to be replaced as new models emerge and take their place. The schools benefit, the students benefit, and of course industry benefits. Surely a win-win-win situation for all. 1 Rossomando EF. Innovation in dental practice in the decade 2000 to 2010: A confluence of science, politics, and social change. Compend Contin Educ Dent 2010;31:100, 102-3. 2 Rossomando EF. The lessons of history on charting a new pathway for acceptance of innovations. Compend Contin Educ Dent 2008;29:364, 366, 368. 3 Rossomando EF. The dental enterprise: Collaborating to build an innovation center for the delivery of oral healthcare. Inside Dent 2008;4. 4 Rossomando EF. Dental industry and academia unite to foster product development. Compend Contin Educ Dent 2004;25:450, 452-4. 5 Additional information on CRET. Available from: www.cretdental.org [Last accessed date on Dec 12, 2013]. 6 Rossomando EF. The Transition from xenodontics to biodontics in dentistry. J Am Coll Dent 2006;73:32-4. 7 Rossomando EF. Biodontics: The next dental frontier. Inside Dent 2009;5:10. Additional information on CRET. Available from: www.biodontics.org [Last accessed date on Dec 12, 2013].